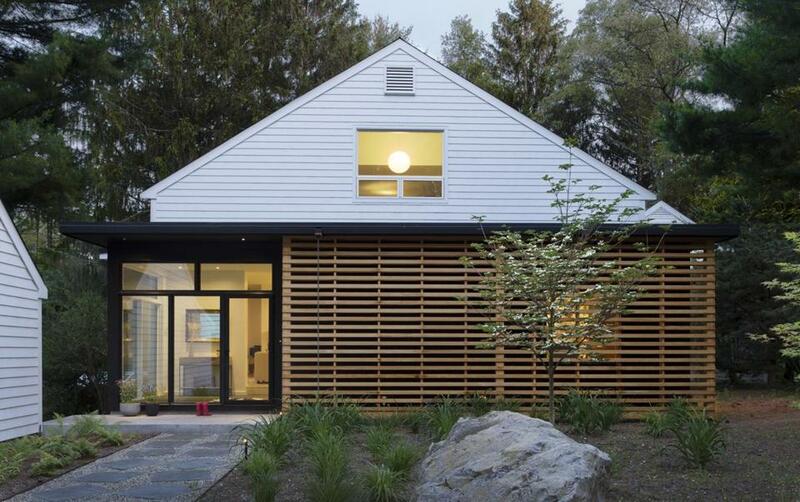 A renovation to a home in Lincoln pays tribute to its history, while adding a hint of Japanese style. The print by graphic artist Ikko Tanaka was a gift. The George Nakashima coffee table is from Lekker. That property wasn’t quite right, but they fell hard for another Hoover home. Originally three 19th-century barns that Hoover turned into a residence in the early 1950s, it was reinterpreted in 1985. “We loved everything about it — the gracious proportions, the attention to detail, the majestic siting in the woods,” Bermont says. 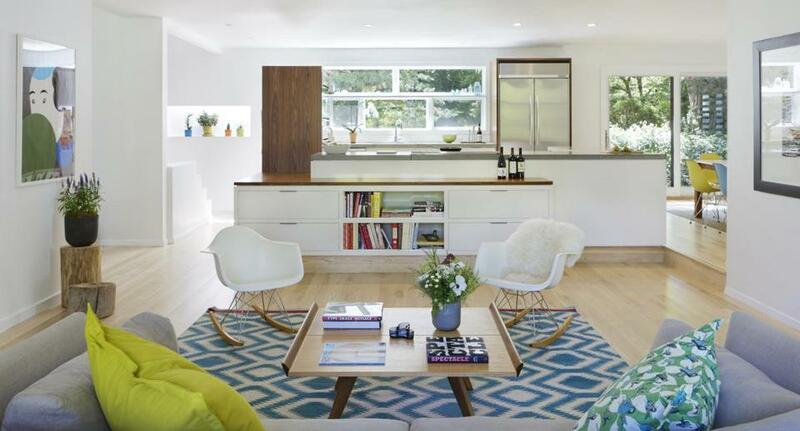 The couple and their daughter, Chloe, now 4 (they also have an 11-month-old son, Louis), lived in the 4,300-square-foot house for a year before hiring Mette Aamodt and Andrew Plumb of Cambridge-based Aamodt/Plumb Architects, a wife-and-husband team with strong modernist sensibilities. Step one was to create a master plan for a layout better suited to a young family. 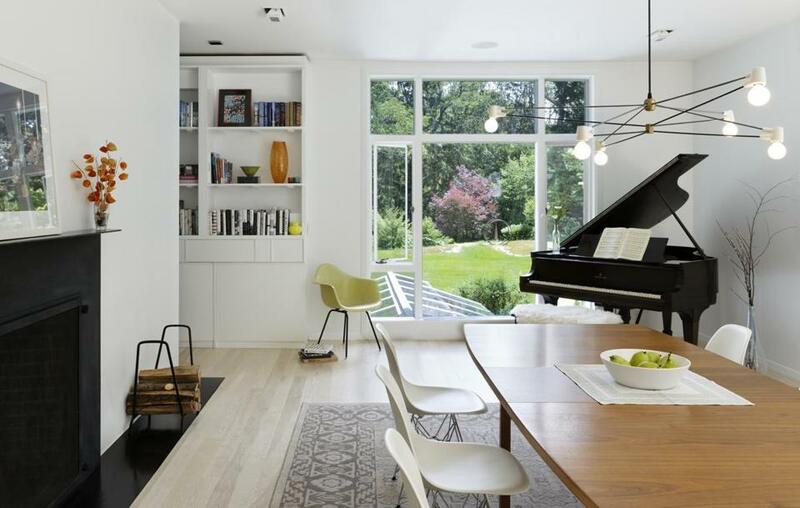 The vintage teak dining table belonged to Alex Benik’s grandfather, who lived in a mid-century modern house in Connecticut, and the piano was Becky Bermont’s great-grandmother’s. 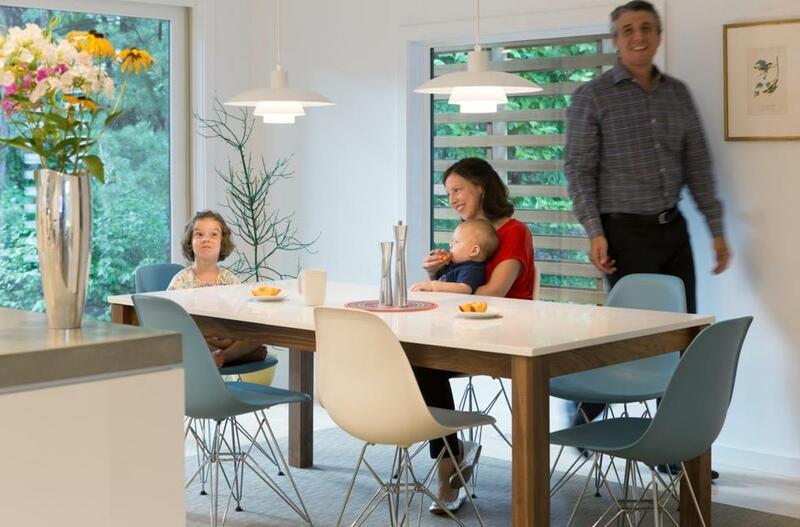 Bermont, Benik, daughter Chloe, and son Louis relax in the breakfast nook, where Eames chairs surround a Room & Board table beneath iconic pendants by Louis Poulsen. Although it still looked fantastic, the funky sculptural kitchen commissioned by the previous owners 30 years ago didn’t function well for a growing family. The new open kitchen, a step up from the living room, lends what Bermont calls a “captain of the ship feeling.” It has concrete countertops juxtaposed against glossy white cabinetry and large windows that frame the landscape. Upstairs, a semitransparent gray stain gave the 60-year-old cork flooring a fresh look. Aamodt and Plumb created a master bedroom suite with two walk-in closets under the eaves, adding sliding barn doors made of birch plywood. Also built under the sloping roof, the Zen-like master bath has a soaking tub beneath the skylight — another place where indoors melds with outdoors. The demolition of the gallery space that once connected the garage to the house (pictured in 2013) cleared the way for the new main entry. Bluestone pavers set askew on the path to the new glass-walled entry came from the demolished gallery space. Although Bauhaus school founder Walter Gropius put Lincoln on the architectural map with the 1938 home he designed for his family, Henry B. Hoover (1902-1989) was the architect of the town’s first modernist house, in 1937. The Harvard-educated Hoover designed more than 100 houses across the country, more than half of them in Lincoln and other Boston suburbs. His children put the family home, the Hoover House, on the market for the first time earlier this year. It has characteristics similar to those of Becky Bermont and Alex Benik’s home, including its thoughtful siting, which creates a strong connection between indoors and out.